Happsy is a new kid on the block but that has not stopped the company from having high expectations. They join a rapidly expanding natural mattress market with competitors like My Green Mattress, Eco Terra, Avocado and Zenhaven. Like Happsy, these companies offer eco-friendly hybrid models. Our Happsy Mattress review explores what’s different about this latest startup. Unlike, traditional bonnell innersprings, the coils operate independently of each other. They provide customized comfort and support while limiting motion transfer. This is ideal for couples who wish not to disturb their sleep partners when they move. Each coil is pocketed in synthetic mesh fabric that is approved by the Global Organic Latex Standard. Heat sealed together, no glues are required. Happsy utilizes 14.5 gauge perimeter coils instead of a polyurethane foam encasement. 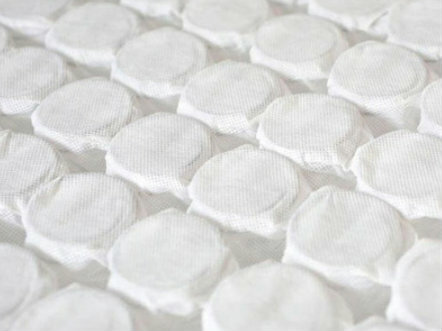 Organic cotton pads are physically attached the bottom of each outer coil. This system provides the best possible edge support and breathability. Happsy mattresses are proudly handcrafted in the US. Materials are domestically-sourced whenever possible. The only major exception is the use of organic latex which is derived from the sap of the non-US native, rubber tree. Because the rubber trees are not harmed in the process, organic latex remains a renewable, eco-friendly option. The finest of this product is imported to provide your mattress with superior support and comfort. All latex is certified to meet GOLS (Global Organic Latex Standard) specifications. Natural Organic Latex is pressure relieving and conforming. It is often described as having a bouncy feel. This foam creates the sensation of floating on top of the mattress. This is in stark contrast to the sinking feeling many Memory Foam owners experience. Unlike Memory foam, organic latex sleeps cool and has no off-gassing issues. Synthetic latex can sleep hot and have off-gassing issues. It’s cheaper to produce and is of lesser quality than natural latex. There’s a number of low priced bed in the box models that offer synthetic latex. Don’t let this ruin your perception of quality foams. Happsy uses only all natural organic latex. 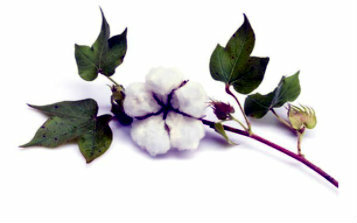 US grown without pesticides, this cotton is certified to meet Global Organic Textile Standard (GOTS). Soft with just the right amount of stretch, it allows for body conformity. Organic cotton is used in both the ticking and side panels. it provides a breathable, cool and safe cover. 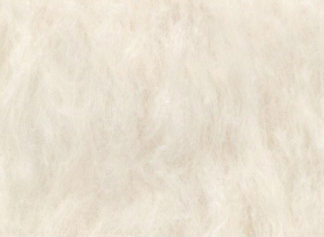 Organic wool is a natural heat regulator. It helps keep you cool in the summer and warm in the winter. Because it acts as a natural fire barrier, no harmful chemical retardants are needed. Under extreme heat, wool will char but will not burn. Organic wool used in the Happsy Mattress is also Certified GOTS. Quality edge to edge coil construction and natural organic latex combine for superior support and alignment. Organic Latex is both pressure relieving and buoyant. It contours to your body with a little bit of bounce. The combination of latex and individually pocketed coil is a bit more conforming than latex alone. For those seeking a softer feel with more body hug, we recommend the organic pillow top option. Organic latex is great for limiting motion transfer. Also, pocketed coils operate independently to lessen partner disturbance. Ease of movement is a strong suit of organic latex. 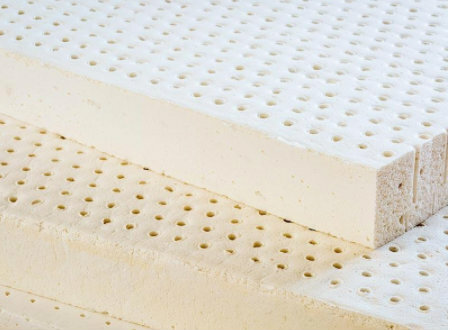 This natural foam has far more bounce and responsiveness than memory foam. While all foams retain some body heat, organic latex naturally sleeps cooler than any synthetic foam. The Happsy mattress has absolutely zero off gassing issues. Natural organic latex, organic cotton and organic wool emit no dangerous toxins into the air. That said, an organic mattress can have natural scents when first unpackaged. The aroma of natural latex has sometimes been described as a mild scent of almonds. Organic wool, when first unpackaged can have a slight musty scent. Neither are particularly offensive and usually dissipate within a few days. Happsy’s 8” pocketed coil system and natural latex provide a solid durable structure. As with most quality mattresses, expect a good 8 - 12 years of support and comfort. 14.5 gauge perimeter coils provide tremendous edge support. It also makes for a larger sleep surface by creating more consistent edge to edge comfort. Happsy has a risk free comfort trial period of 120 days. This should be more than sufficient enough time to decide if Happsy is right for you. During this time frame you can return your mattress for full refund if not completely satisfied. We recommend giving any mattress you purchase a minimum of 30 days before making that decision. Often times, it takes that long to adjust to your new bed. Happsy warranties against defects in materials or flaws in manufacturing for 10 years. In either instance, Happsy will repair or replace your mattress. Your mattress will be shipped free to your doorstep anywhere in the continental U.S.
Ease of movement and natural bounce transcends to another great attribute of the Happsy mattress. Happsy is the best priced quality organic mattress we have reviewed. But, it’s the quality that makes it one of the best overall values we’ve seen. The Happsy Mattress is rated a Medium Firm. This level of mattress is generally a good fit for most back and stomach sleepers. It offers great support and alignment with just enough softness to relieve pressure points. It will also accommodate a large percentage of side sleeper needs. Add a 2″ Organic Latex Topper for a softer feel with more body hug. 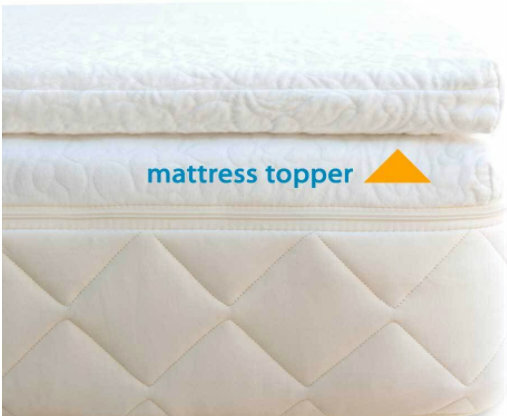 The topper is ideal for side sleepers in search of more conformity and pressure relief. Shoulders and hips are cradled to alleviate stress while keeping perfect alignment. Side sleepers will notice that either option provides decent contouring. However, pressure sensitive individuals may benefit from having 2 extra inches of natural latex. If you’re unsure if you need the extra softness, you can start with the Medium Firm and latter add the Pillowtop option later. Back sleepers will like how Happsy relieves pressure by allowing your body to float on top of the mattress; rather than sinking way into the foam. This results in a more stabilizing structured feel that provides great alignment. Like back sleepers, stomach sleepers will benefit from a more structured mattress. To prevent the lower from dipping to deep and causing lumbar pain, we recommend the medium firm. That said, no to sleepers are alike and the topper can always be added later. Tremendous edge to edge support is derived from a over 972 individually pocketed coils. Certified organic: All natural materials are ideal for allergy sufferers or anyone wishing to sleep in a chemical free environment. No off gassing issues. Happsy is CertiPUR certified to not emit dangerous toxins into the air. Low motion transfer thanks to pocketed coils and quality foam. 120 day comfort trial: return for full refund during this period if not fully satisfied. Latex allergies: For those with confirmed allergies we recommend taking a conservative approach and choosing another option. No white glove in home delivery service offered. Most people will require two sets of hands to bring into the house. With assistance, setup is quite easy. Those who are looking for a 100% natural organic mattress will find Happsy a great buy. Allergy sufferers and young children will benefit from sleeping on a mattress that uses no chemical fire retardants. If you like your mattress to have a little bounce. Those who have tried out expensive natural latex hybrids but felt this quality was out of reach. These shoppers will be excited to find Happsy. If you are a big fan of memory foam or a mattress with an extreme amount of body hug, Happsy may not be your mattress. The Happsy mattress creates a floating, not sinking feeling. In essence, you lay on it, not in it. If you have a latex allergy, we recommend choosing another option. It’s important to note however, latex allergies are caused by direct contact with the skin. 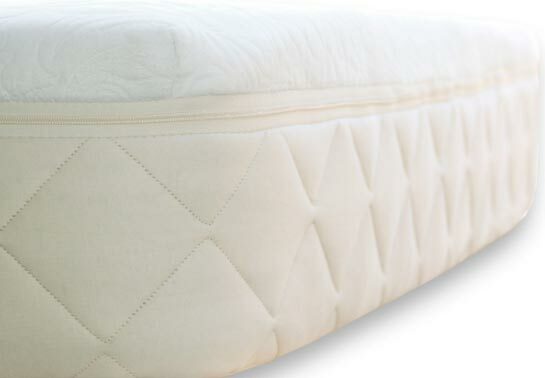 Happsy’s cotton cover creates a barrier and this mattress should pose no danger. That said, our recommendation is still to err on the side of caution. Happsy does not have a white glove in-home setup available. If you are physically incapable of handling this amount of weight (queen size at 110 lbs), you’ll probably want to choose another mattress or get someone to help you. A queen size Happsy mattress weighs 110 lbs. Although this setup can if necessary be done by one person. It’s a much easier job with a second set of hands. Once you have brought your mattress to the room it will be used, remove the Happsy from its box and lay it across your foundation. A cutting tool is provided to carefully slice through the packaging. Unroll your mattress and cut the vacuum seal. You will immediately hear air rushing into your mattress. Allow an hour or so to fully expand and be ready to sleep on. Aesthetically, expect it to take a few days before the creases and wrinkles unfold. This is normal for many bed in the box mattresses. Happsy offers an affordable alternative to expensive organic mattresses. Priced only marginally higher than polyurethane bed in the box options, Happsy puts a quality organic mattress within reach of everyone. We feel the bed represents an exceptional value well worth consideration. We recently had the opportunity to speak with Dale Luckwitz, strategist at Happsy. He discussed the mattress, the mindset, and motivation behind their new product. Happsy, is an interesting name. How did it originate? There is a virtual sea of online mattress companies; what separates Happsy from the pack? The terms “Green” and “Organic” are getting tossed around a lot these days. It’s easy for consumers to get confused by all the online chatter. How can they make sense of everything that they hear? Happsy has many certifications. Global Organic Latex Standard (GOLS), Global Organic Textile (GOTS), to name a few. Can you tell me a little about the materials used that meet these specifications? “We use certified organic cotton and wool that are both certified GOTS, and source our cotton fill and jersey fabric from the U.S The wool acts as a natural fire retardant so no harmful flame retardant chemicals are needed. For the foam, we use Organic Dunlop Latex. There is less processing involved than Talalay. Dunlop is the only process considered for GOLS certification. Of course, not all latex is the same. Organic Dunlop comes from organic rubber tree milk. Some companies use synthetic latex or blends with very little natural product present. Can you talk a little bit about Happsy’s coil system? I understand Happsy consulted chiropractors during the initial development stages. What type of impact did they have on the final product? Service can make or break a new startup. What would you like people to know about Happsy’s approach to customer satisfaction? We want to thank Dale Luckwitz for his time and insight. Happsy offers a supportive, safe and healthy alternative at an attractive price point. We recommend you consider this exceptional company.